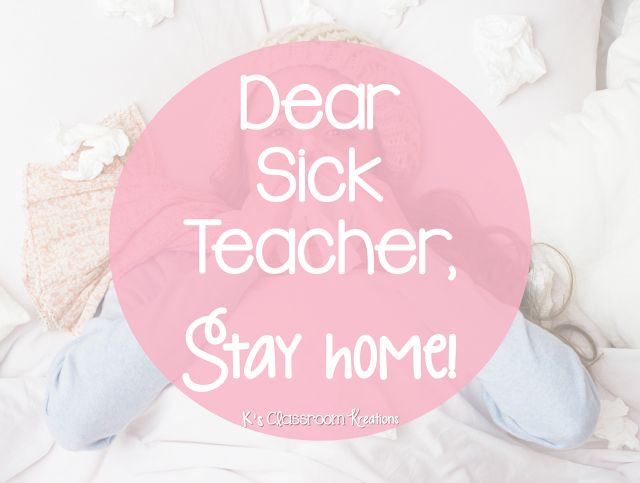 Dear Sick Teacher, Stay Home! Ever have one of those days where you feel like curling up in bed and never leaving? And then....you remember you're a teacher. Ugh! 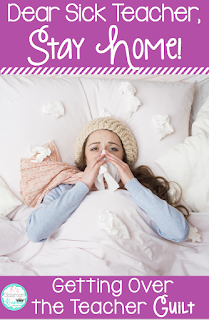 Should you take a sick day? What about your students? Certainly they will forget everything you've ever taught them while you're gone. Also, no doubt your room will be destroyed, your team will hate you for being a slacker, and your principal will fire you for being out! Ok, maybe it's just me who has those last few thoughts... but I have a sneaking suspicion I am not alone. Just in case there are a few others out there debating whether to take a sick day or not...hopefully I can help. One of the hardest parts of being out is dealing with the teacher guilt that comes along with it. Near the end of January everything started to hurt and I felt awful. After pushing through for far too many days I accepted defeat when the doctor said I had the flu (and my coworkers kept giving me the stink eye if my germy self walked near them ;) ). I knew I couldn't infect my students. I HAD to stay home. I seriously did not have the time to hear that! 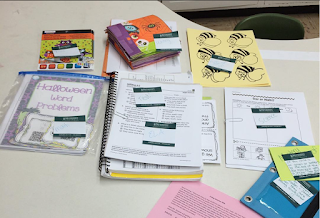 We had just finished middle of they year reading assessments- my kids needed to be in new reading groups ASAP! We had a big staff meeting coming up I certainly couldn't miss. I finally stayed home for 3 days (Tuesday-Thursday) and returned Friday so no one could say I wasn't trying to be there. Looking back, that was dumb. I could hardly stand on Friday and I was not an effective teacher. I should have listened to my body and let myself rest a few more days.....but...that darn teacher guilt! Fast forward a few weeks (while my body never recovered from the first round of flu).... and my world was rocked by a sky high fever, rib bruising cough, and a level of weakness I had never felt before. Yup! I had the flu. AGAIN! Now you can only imagine the guilt this time when I had just been absent a few weeks before! It was even Valentine's Day. I couldn't miss that right?? Luckily for me however, the presence of the high fever forced me to stay home so I didn't have a choice (and honestly I felt too awful for the guilt to last long). And although I am sure my room was chaotic, they all survived. Why is it that as teachers if we have a fever or are vomiting, or some other massively infectious issue, we can justify staying home? But if we can't move or think or function from feeling so icky we still ask all our friends (and Facebook groups) what to do? We know the answer. STAY HOME! We just want someone to alleviate that TEACHER GUILT feeling by giving us permission. 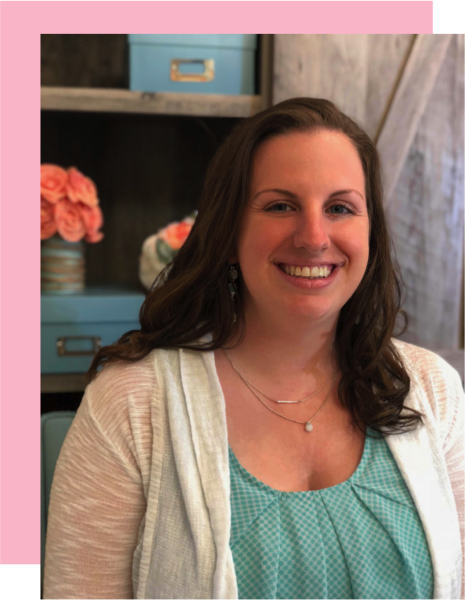 So here it is teacher friends. If you are too sick to stand (with or without fever), if attempting to think makes your head hurt, or if even your pet is disgusted to be near the level of germs you seem to be carrying... STAY HOME! If you have a hang nail, a minor headache, just kind of feel blah...I would say try to push through. Although an occasional mental health day may be ok, we all know that our students learn best from us. It is so important to be at school when we can. Just keep in mind, we are human. We get sick. Pushing ourselves to the max is only going to extend the illness and drag out our recovery process. Ok, so now you decide to stay home. The next thought that runs through your mind is sub plans. I swear, there is nothing worse than trying to peak through barely opened eyes to type up sub plans. What other job is this much work to be absent??? Well, it's a part of the job no one likes but we all have to deal with. 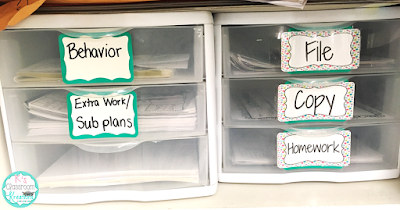 For me, I have a google doc template that has all of my notes to the sub like our schedule, classroom info, student info, literacy block/station routines. I simply open up our weekly first grade lesson plan and paste as much content into the template as possible. Of course, more details need to be added and some things aren't sub friendly (like introducing a new skill, or massively involved experiment). But, at least its a starting point. I just reuse the template the next time I am going to be out and change out the lesson details. It saves so much time! I also have a drawer (it's not cute, don't judge!) where I keep a stack of extra worksheets and activities that a sub could pull from if they need extra work. While I prefer to try to stick as close to the original lesson plan as possible, others have more generic lesson plans prepared that cover review skills. 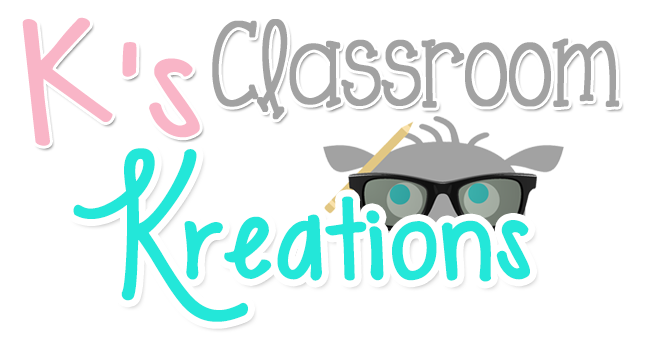 You can find TONS of Sub Tubs and pre-made lesson plans online. My sweet coworker has folders prepared with plans and materials, complete with sticky notes, for up to 5 days. All she needs to do to be out is to find a sub and ask one of us to take out a folder. I am so jealous that she is this prepared! Find what works for you. Do you want generic plans? Do you want to try to stick as close to the preplanned lesson as possible? 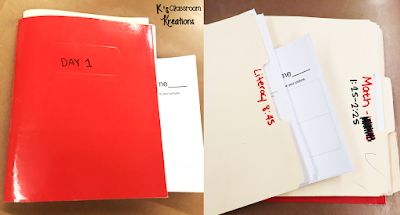 Just make sure you have someone you can go to that will pull out whatever materials you ask for and can print sub plans for you. My entire team has been out sick with the flu this month at some point, and I KNOW we wouldn't have made it through without each other. If you decide to stay home, get rest. Seriously, shut down the computer, stop looking on Pinterest for teaching ideas, quit texting the sub to see if everything is going ok....REST! Also, it's unacceptable to catch up on chores and cleaning (unless you are de-germ-ifying). This is not a vacation. You are sick. Find your favorite blanket, movies, box of tissues, and chicken noodle soup. We all know how much work it is to be out. Treat it as the rare occasion it is and try to get well. Pushing ourselves is only going to make it worse. Now I say all of these things knowing that it feels impossible to shut my own teacher brain off. However, when I finally gave myself permission to heal this last time, I did in fact get better. Imagine that! I hope that if you are sick you can give yourself permission to be human and stay home. Have a game plan ahead of time so it doesn't feel as overwhelming. Know that when you return your classroom and students will still be there. Yes, there may be a mess. Half of the things you put on your sub plan won't be done and you'll wonder what they did all day. It's ok. Honestly, they survived, and so did you!